Top Mount Chimney Caps (typically used with multiple flues but also used with chimneys with a single flue) mount on the concrete crown of the chimney. They can also be used if you have only one flue on the chimney. You can attach a top mount chimney cap either with 1/4” Tapcon screws (using a 3/16″ Tapcon drill bit) that go through pre-drilled holes in the chimney cap flanges and then into the crown, or you can attach it with Construction Adhesive that affixes the chimney cap flanges to the cement crown. 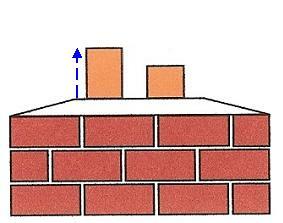 • First, measure the length and width of your entire chimney, as shown by the red dotted line in the diagram below. 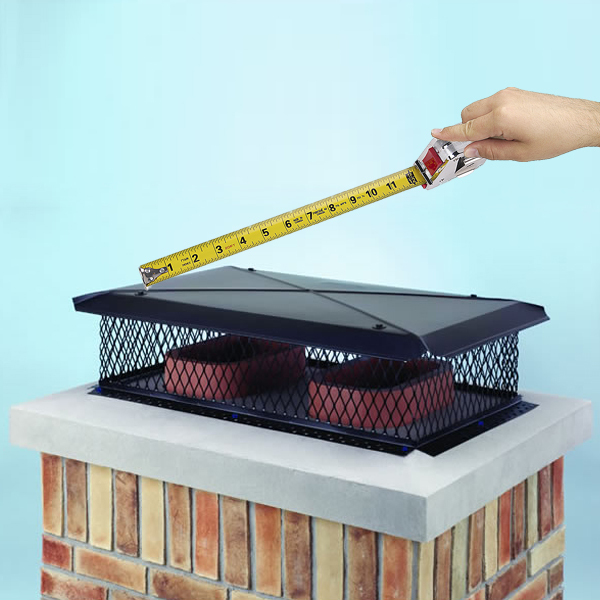 • Next, measure the length and width of a rectangle just big enough to include all the flues on your chimney, as shown by the black dotted line. This is the minimum screen size. • Last, measure the height of the tallest flue above the top of the chimney, as shown by the blue dotted line . • If your goal is to protect the top of your chimney from deterioration caused by weather and acid rain, choose the largest screen size that will fit within the red dotted line. • If your goal is to be as economical as possible, select a chimney cap the size of the black dotted line. • If your goal is to get the maximum protection for the top of your chimney for the minimum price, select a chimney cap size midway between the red and black dotted lines. Which Metal is Best for a Top Mount or Multi-Flue Chimney Cap? Multi-flue chimney caps are manufactured from stainless steel, copper, and black galvanized steel. Stainless steel is the best value for the dollar. Copper is the most elegant, especially for historic or upscale homes. Stainless steel and copper chimney caps come with a lifetime warranty. Some stainless steel top mount chimney caps can be powder coated with black or colored heat resistant finish. Galvanized steel is the least expensive and the least durable. Galvanized steel chimney caps are painted black. A copper top mount chimney cap is not recommended for light colored chimneys. Stainless steel is the preferred metal for salt water climates due to its rust resistance. Last updated by Tom at January 11, 2016 . I am trying to find out how high my chimney cap should be above the top of the chimney for proper draft. The top of my chimney measures five foot by seven foot and has six flues in it. I have six brick/mortar posts supporting a one inch thick stone cap. That stone cap is about ten inches above the highest flue. It looks nice and is well proportioned when looking from the ground up. The chimney is about 29 foot high and is 2 foot above the peak of the roof. Yes, below is a walk in fireplace. My problem is when I have a fire in the fireplace, we generally, at times, have smoke in the room. I was told I have to raise the top stone cap higher for proper draft. But no one can tell me how high??? Any Ideas. Looking for some type of formula. It sounds, Tom, like your stone cap, being 10 inches above your tallest flue, is greater than the 5-inches minimum required. We suspect the problem is due to a mismatch between the size of your flue(s) and the fireplace opening (given that it is a walk in fireplace.) An Enervex chimney fan is your best solution. They are guaranteed to work; the fan adjusts to compensate for the lack of sufficient chimney draft. Will it be bad to have a taller cap? The tallest of 2 flues on my chimney is 4″. So a 10″ cap would work for me, but would a 12″ or 14″ be better? 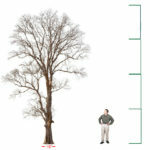 Six inches taller than the tallest flue is a minimum for good draft. A taller chimney cap will cost more, but not necessarily give you a better draft for your flue. 1 Pings/Trackbacks for "Top Mount Chimney Cap Measure"